Representing Austria at #ewc2019rade is RuckTchouk-Traiskirchen, featuring left-shooter, Andreas Türk. The left-handed 21-year old has spoken to us regarding his tchoukballing career and his hopes for EWC 2019 in Radevormwald. Bury Kings, runners up in the UK Super League last season will be appearing in the EWC once again to represent the UK. Among the Kings contingent is their resident queen, Sara Parker. 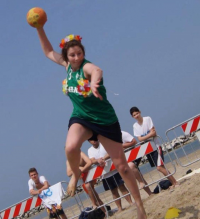 Italian-born Claudia Alessio marks her 10-year anniversary playing tchoukball in no better way than with her first attendance at the European Winners’ Cup this year in Radevormwald. The 27-year-old will be playing with Saronno Castor for the first time this year, having previously been a long-standing member of Bergamo TB, one of the oldest in Italy before it’s closure this year. Alessio has been a member of the National team since 2014, representing Italy at ETC 2016 and 2018 and the Geneva Indoors from 2015-17. With the national team, the right-hander usually plays as a left shooter, but for Saronno Castor, Alessio makes for a solid defender. This week, we bring our attention to Jack Leitch, 28, right-shooter and a star in the making for the UK Super League team Bury Kings. Despite not yet playing for the UK national team, Bury St. Edmunds player Jack Leitch is certainly one to watch. The 28-year-old shooter first picked up tchoukball in 2011 as a way to blow off steam on a Friday night after lectures, playing centre pivot for Portsmouth University, before that idea was laughed off by teammate Andrew Cummins.